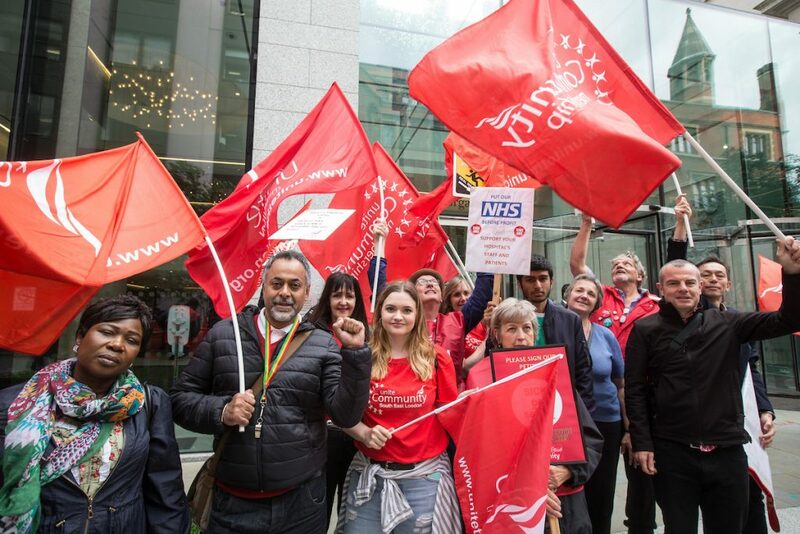 In a stunning display of solidarity, workers involved in three separate disputes were joined by Unite Community branches from across London in a protest against low pay under the banner of “London United”. The ‘hat-trick’ of protests started at 8am yesterday (August 3) outside JP Morgan where Serco presented its half year results to investors. 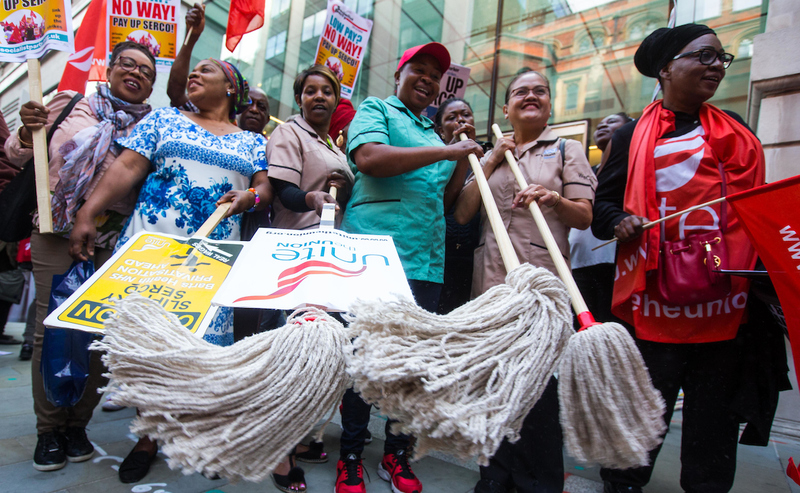 Unite members employed by Serco as domestic staff, porters and security workers at Barts Health NHS Trust [pictured above] are battling for a 30 pence an hour increase. The workers are currently taking part in a 14-day strike that started on 25 July. It follows an earlier 48 hour stoppage and seven day walkout in July. Workers and Community members then moved on to the Civil Aviation Authority for a protest over the approval for British Airways to ‘wet lease’ nine Qatar Airways’ aircraft to cover striking cabin crew on British Airways’ mixed fleet. Unite argues that the approval breaks regulations covering the wet leasing of aircraft. 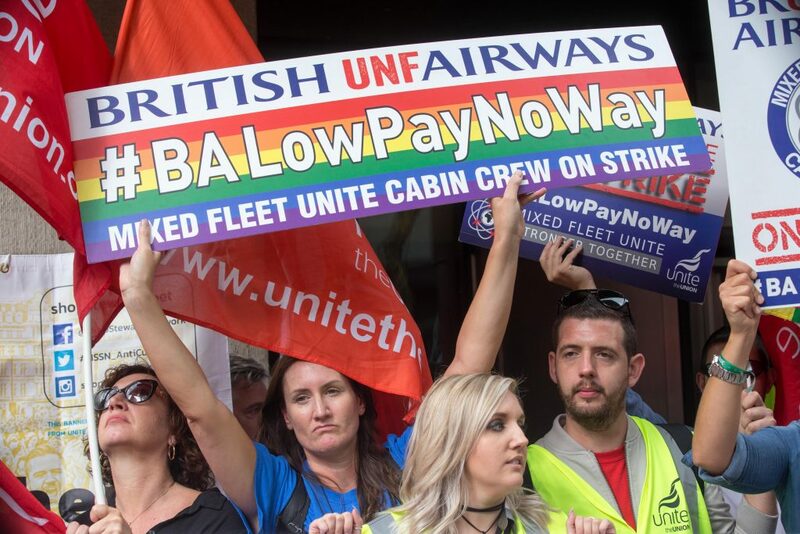 Unite cabin crew members working for British Airways [pictured above] will be taking their 58th day of strike action tomorrow in their fight against poverty pay and the sanctioning of striking cabin crew. 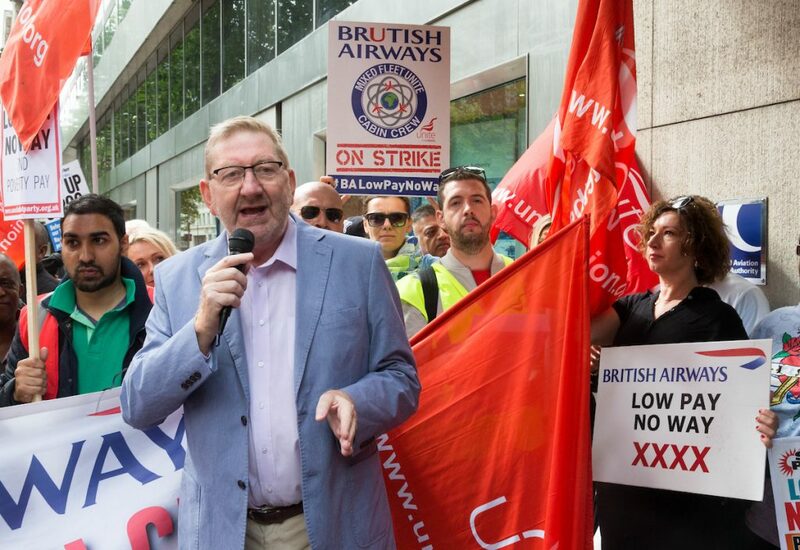 Unite general secretary Len McCluskey [pictured below] gave a rousing a speech at the protest outside the CAA, where he urged workers to press on in their fight for fair pay. 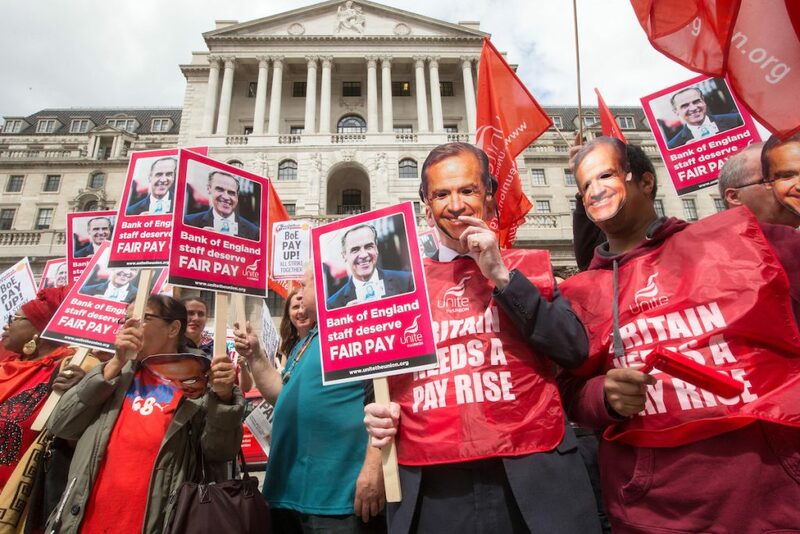 The protests concluded at a rally outside the Bank of England, where workers [pictured below] are striking for the first time in 50 years. Their dispute centres on the imposition of a derisory below inflation pay offer and the refusal of management to engage in meaningful negotiations with Unite over the pay deal for the second year running. Today (August 4) was the final day of a three day strike by workers in maintenance, parlours and security departments. 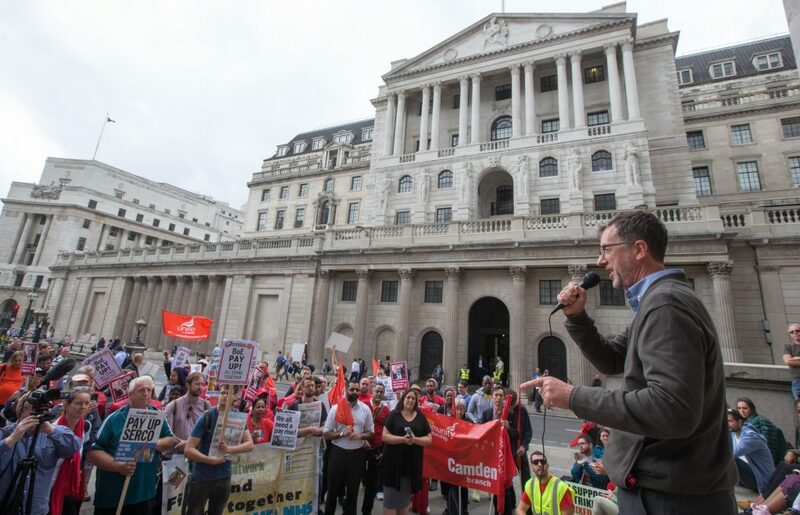 Unite London & Eastern secretary Pete Kavanagh [pictured below] was joined by striking workers as they addressed the crowds standing together united. 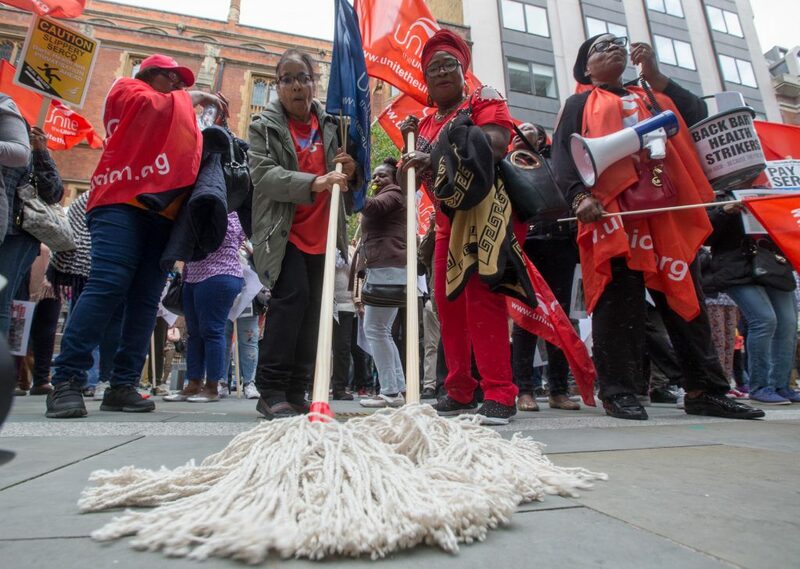 Protesting Unite members marched more than two miles yesterday, when they took their fight for fair pay to the streets of London, as they were cheered by members of the public. Unite regional Community coordinator Dave Condliffe [pictured below, right] said yesterday’s “hat trick” of protests was “enormously successful”. “It was particularly heartening to see so many members from London Unite Community branches – the south east, Camden, east and west – all out in full force to support industrial members in the three different disputes,” he explained. “It was an inspirational show of solidarity – the workers and Community members share the bonds of being part of Unite, a fighting back union. “It was a brilliant day, with the sun shining and you could see the happiness and vibrancy in all our brothers and sisters out supporting each other – far from being fatigued as they carry on in their separate disputes, the protest will have strengthened their resolve,” Condliffe added.